Let’s be honest, those who are managing to hold down a steady job should class themselves as extremely fortunate. Those who get up each morning and walk through the employment doors of prestigious companies like Microsoft, even more so. If you take away the regular salary bank deposits and the respect that comes with working for a huge corporation on extremely popular products, then just what’s left? It seems that employees of the Redmond based company are left with access to an exclusive employee-only white Xbox One, and we couldn’t be more envious. It isn’t exactly a well kept secret that certain employees of large technology companies have product-based employment benefits. In the past, Microsoft themselves have been known to furnish high-performing staff members with smartphone and tablet rewards, but this limited edition white Xbox One seems like the most rewarding benefit yet – for those who will be lucky enough to receive one. The leaked internal image suggests that a number of current Microsoft employees will be eligible for the free gift when the next-generation console launches later this year. The exclusive new piece of hardware will be presented to eligible employees with a unique white and silver color overhaul, making it immediately stand out from the devices that will be available to the public. It doesn’t end there either. In addition to being handed the free console, those who are eligible will also be given a number of additional perks to sweeten the deal. 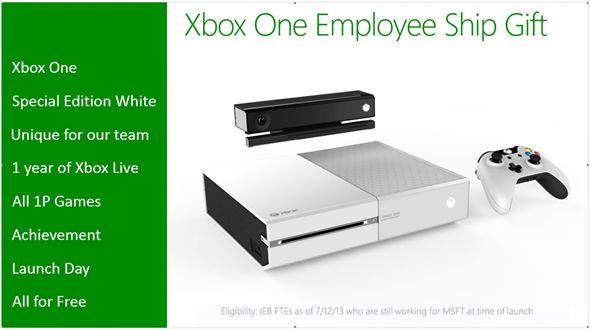 Those lucky employees will be handed a full year’s free access to Xbox Live LIVE and “All 1P Games”. As you might expect, there hasn’t been any official confirmation from Microsoft regarding the legitimacy of this offer, but it seems like a lot of effort for someone to go through if it isn’t a real internal offer. If you happen to be a Microsoft employee and are beginning to get excited then it’s worth pointing out that the leak does state that only full-time staff in the Interactive Entertainment Business department will be handed the deal. Still a pretty sweet gesture from Microsoft.